Rob Harris, left, Craig Moorhead, Brandon Herbert and Anna Baker hold their big catch of the day. They soon switched over from amberjack to hogfish, grunts, snapper and porgy. It was a beautiful January day with calm weather. The friends, Rob and Craig of St. Pete and Brandon and Anna of Michigan, enjoyed a fun trip with Capt. Jason Stock. 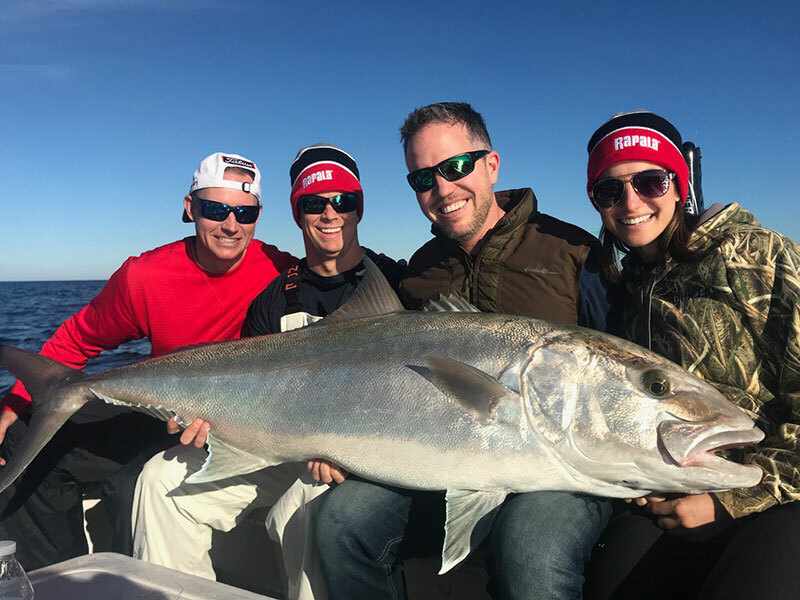 Fishing around Anna Maria Island is holding steady to its wintertime pattern, which means you need to be flexible when deciding when, where and what to target. During the winter months on Anna Maria Island, we can experience all spectrums of weather. During the cold fronts, we see raw, gusty winds and cold snaps down to the 40s. After the fronts, things can improve greatly, with calm waters, light winds and temperatures reaching into the 80s. Conditions play a major role in what fish to target and where to target them. On the cold, windy days, offshore fishing can be out of the question due to rough seas and less than favorable conditions. But, there is still fishing to be done. 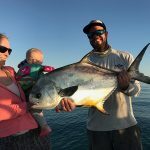 Fishing sheltered inland waters such as the Intracoastal Waterway or smaller mangrove-lined bays north of the Manatee River is ideal. Using live shrimp as bait can yield numerous species, including sheepshead, pompano, black drum and catch-and-release redfish. Trout fishing with soft plastics also is productive over deep grass flats and in canals. On days between fronts, venturing into the Gulf of Mexico can be fulfilling. 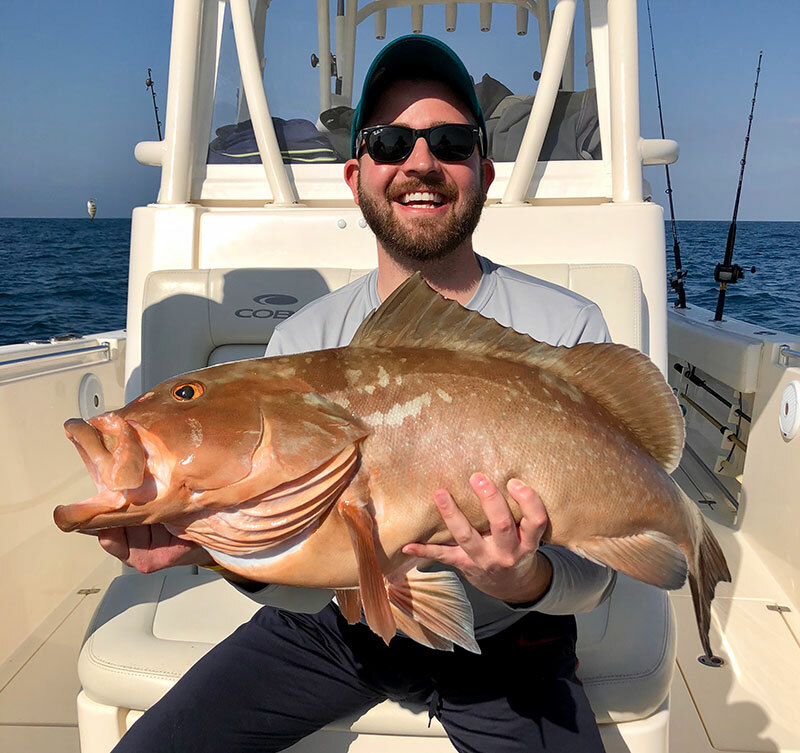 Fishing nearshore ledges and reefs can be quite productive for a number of species, including snappers, grunts, porgies, hogfish and grouper. 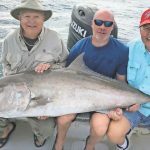 If you’re out long enough, you can encounter large fish, such as amberjack and permit. Needless to say, there are always options when fishing around Anna Maria Island. You just need to keep an open mind and be happy with what Mother Nature presents to you. On my Southernaire excursions, I’m following this pattern. On the cold, windy days, I’m staying tucked up in small bays, canals and the ICW, where there’s great inshore action. Sheepshead are quite abundant and a great “go to” target when conditions are less favorable. And what’s good about sheepies is the conditions don’t seem to bother them, which means they readily bite in cold weather. Plus, they are among my top choices for tastiest fish. I’m also seeing a great resurgence of redfish. Sport fishers casting live shrimp to these catch-and-release fish are producing respectable numbers of hookups during morning fishing trips. And, while targeting the reds, I’m seeing black drum and snapper take the bait. 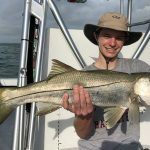 On the calm, sunny days, I’m venturing into the Gulf of Mexico to fish the ledges, reefs and wrecks — host to a number of species; producing snappers, Key West grunts, porgies, hogfish and numerous undersize grouper. A bite occurs on almost every drop of bait. Plus, you get some good eating fish to bring home for a fish fry. Jim Malfese at the Rod & Reel Pier says sheepshead are the main attraction. Casting live shrimp under the pier on a weighted rig is attracting the tasty nibblers to the hook. While targeting sheepies at the pier, you can expect to encounter catch-and-release redfish, black drum and an occasional flounder. Capt. Warren Girle is fishing inshore with good results. By fishing with live shrimp as bait, Girle is putting clients on a variety of species — especially around structure, such as docks, canals, rock piles and oyster bars. Black drum and catch-and-release redfish are taking the hook, as well as numerous sheepshead. Mangrove snapper and flounder are in the mix, although they are not being caught as frequently as the sheepies and drum. Moving offshore, Girle is fishing ledges in 40-60 feet of water, which is producing good action on snapper, Key West grunts and small grouper. Capt. Aaron Lowman is rocking the dock fishing — finding great action for his clients. Numerous sheepshead are being caught by casting a live shrimp under a dock during slower moving tides. Most sheepies are 1-3 pounds, although larger fish are mixed in. 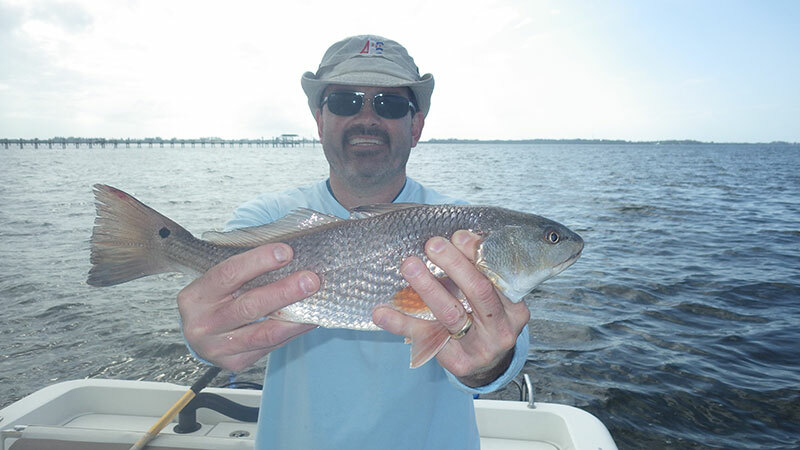 He’s also finding action in the canals on black drum and catch-and-release redfish. Moving to the grass flats, Lowman is drifting and jigging with soft plastics to trigger a trout bite. Grass areas with depths of 3-6 feet of water are hosting 12-18 inch spotted seatrout. Lastly, nearshore fishing in the Gulf of Mexico remains strong for Lowman as long as the winds are light and seas calm. 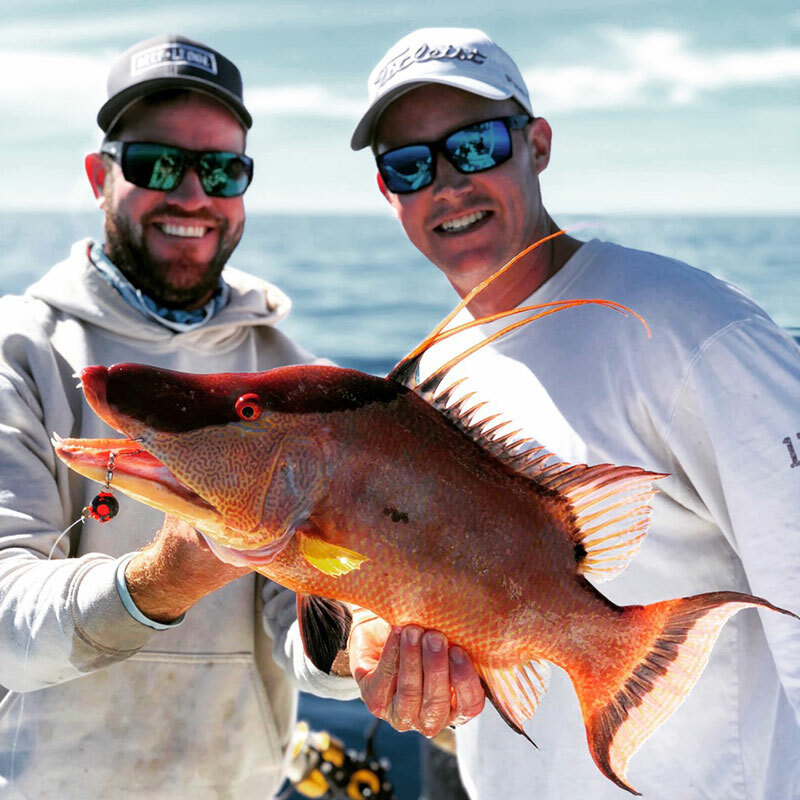 Snappers, groupers, Key West grunts and porgies are rounding out the inshore bite on his charters. Capt. David White of Anna Maria Charters also is working inshore, where he’s serving up a variety of species. 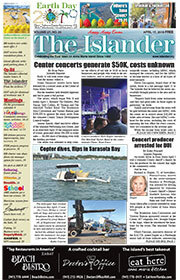 Fishing around rocks and docks is yielding sheepshead, black drum and catch-and-release redfish. Also found inshore are pompano, which are being caught by casting jigs over deep grass flats where sandy potholes or channel edges exist. On calm days, White is moving offshore, putting clients on big mangrove snapper on the ledges in 40-70 feet of water. Hogfish, porgies and grunts also can be found on the ledges. Lastly, red grouper weighing up to 20 pounds, are being caught in slightly deeper water. Capt. Jason Stock is patrolling offshore, where he’s putting anglers on AJs weighing 30-90 pounds. Other species turning up for Stock are hogfish, numerous snappers and tripletail. These species are being caught using live shrimp on a bottom rig.